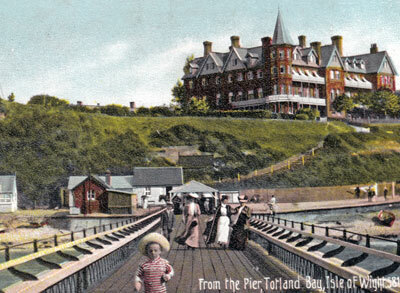 The Totland Bay Pier was opened in 1880; about the same time the Totland Hotel was built on the hill above the bay. 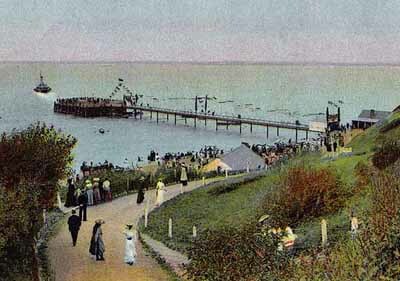 As with other island piers, Totland Bay Pier was popular with pleasure steamers from mainland resorts and those on round-the-island cruises. It was also served by the passenger ferry between Yarmouth and Lymington. During WWI, pleasure cruises ceased but the passenger service continued until 1918. During WW2, a gap was made in the pier so that it would be unusable in the event of an attempted invasion. Repairs necessary after WW2 meant that the pier didn't reopen until 1951, pleasure steamers continued to call until 1969. 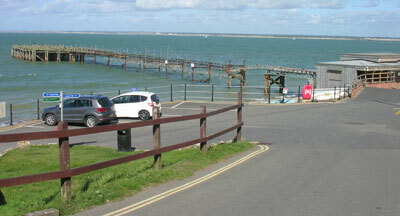 In 1971, the pier was purchased by Trinity House as a base in the western Solent. It was sold again in 1975 when Trinity House introduced a new type of Pilot Boat. Although the pier continued to be used by local small craft, over the years it became increasingly dilapidated. Some repairs were made in the 1990's to the extent that MV Balmoral was able to pay a visit in 1993. The current owner (2015) has plans to restore the pier and reopening it to the public with a unique holiday dwelling on the seaward end. The scheme also involves the replacement of the pier cafe and the formation of a retail unit at the land end of the pier, but progress is slow.